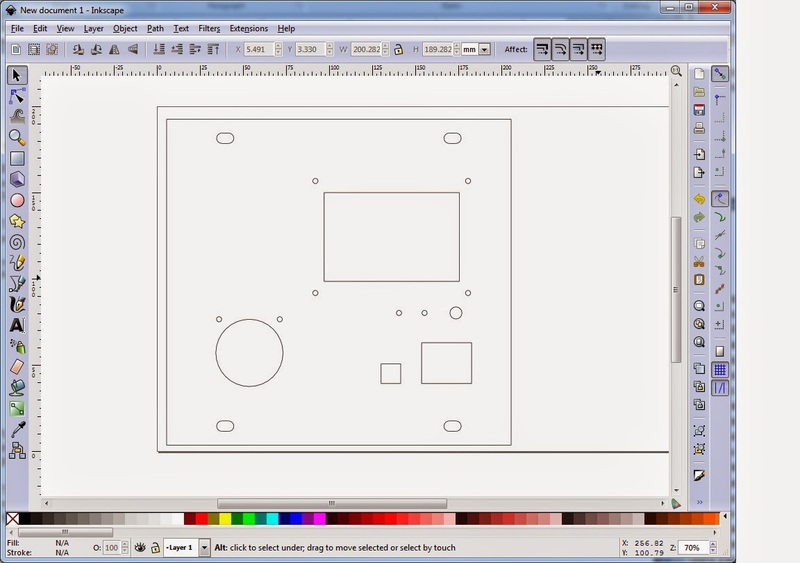 3/31/2015 - Updates made in the Firmware and Inkscape plugin section below. Thanks go to Turnkey Tyranny for the many improvements and fixes he's contributed. Also, I would like to note, there are many variations on the Laser supplies. Please be very aware whether yours is an ACTIVE LOW or ACTIVE HIGH enable signal. The firmware below is ACTIVE LOW. Please excuse the picture quality, when I get some time I'll try to take better ones. Electronics ($65) for everything on ebay - im sure theres other deals out there too! - Modified firmware the Lansing Makers Group started. The one here I modified to have an active low LASAR activation signal. Turnkey Tyranny one is the current go to favorite. - (optional) Lightobjects.com Power table bed for the K40 Laser machine. 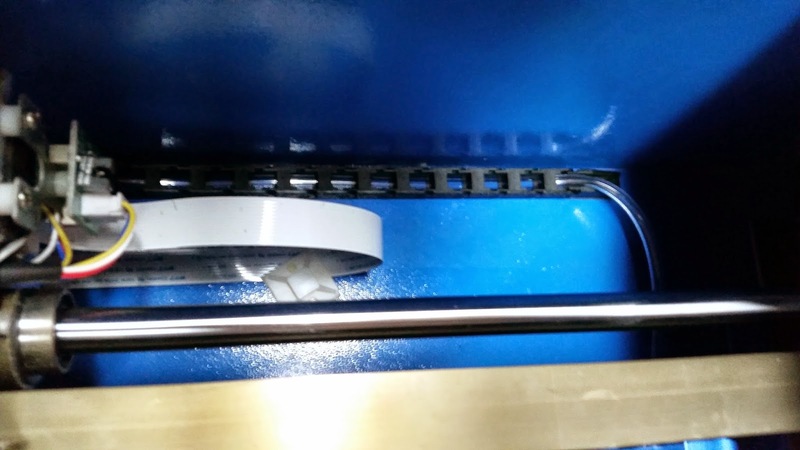 Note: be ready to bend and reseat screws until the stepper can turn the belt to raise and lower. I still dont have mine working right. In this case you want to connect D5 to L. WP to GND is the normally closed interlock loop. D6 to IN for the PWM (Laser intensity) signal. Also, if you are using your own firmware, L is active low for laser on, and H is active high. 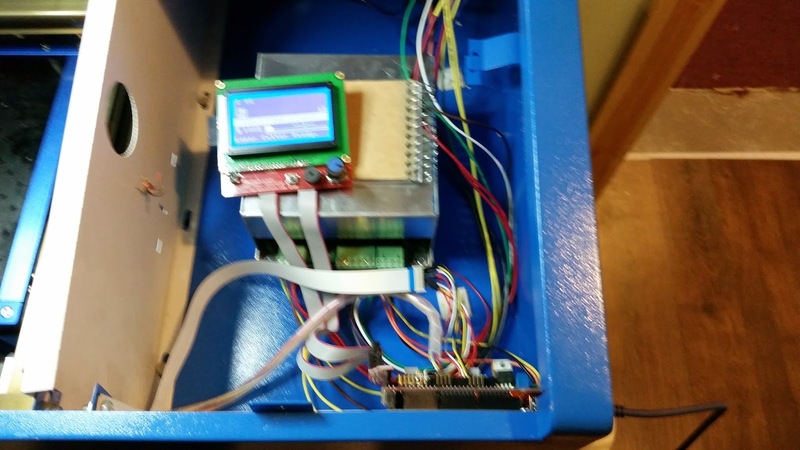 I designed the panel to mount the LCD control board, current meter, on/off, and laser on/off controls to. - G07 is RASTER line. - Check the direction of the fan mounted inside. Mine was blowing out... Blowing in is much better and smells better too. Just a 5 minute job got it hot to the touch. RESERVED FOR DOCUMENTING ADDITIONAL LASER SUPPLIES. STAY TUNED. ** Add a case switch and water flow switch to the interlock loop so I don't burn an eye ball or the laser tube. 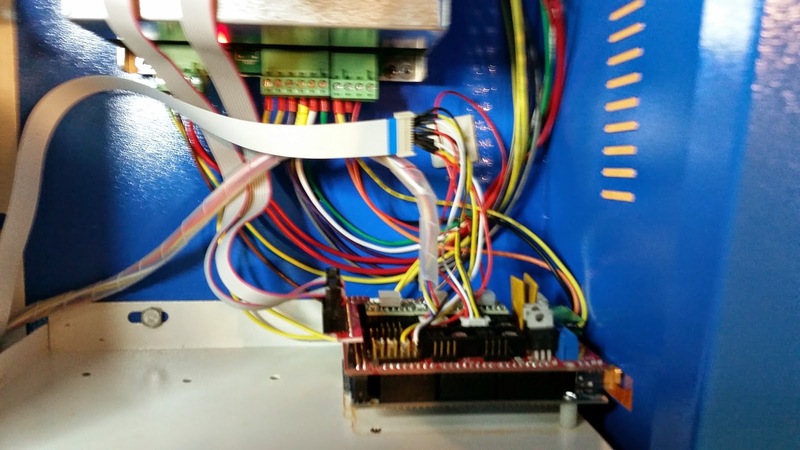 ** Design a PCBoard that will plug into the RAMPS and allow for an almost seamless upgrade by just plugging all existing cables into the new electronics. Any Bitcoin donations would be greatly appreciated, and help fund any current & future projects. Your post is nice but YOU DON'T SAY what Cheap Chinese unit you used as a base. Could you please update your post with a link to the original unit you modified, and perhpaps its price? Thanks. 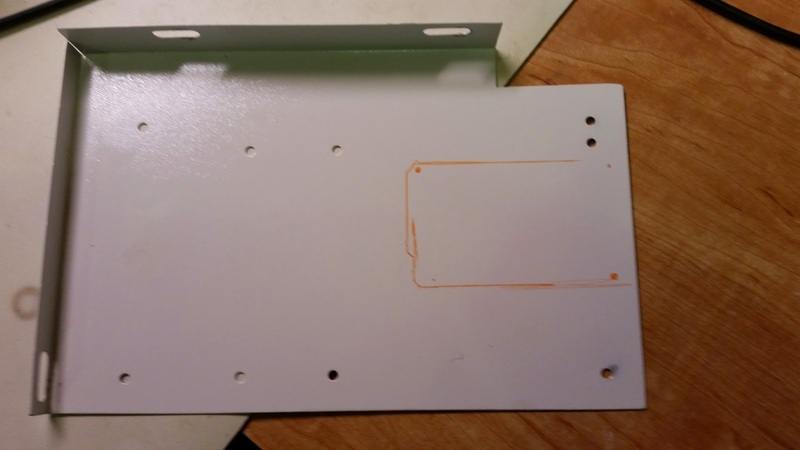 @ Nerd Progre: The cheap unit he used as a base is called a k40 laser cutter. You can find them on ebay for about $400 now. If I upgrade my cutter like this, would I be able to use a good slicer like Simplify3d to make the gcode? If so, are there profiles that exist already? I'm sure they don't have one that is already in the software build for this setup. I'm playing with an image to g-code tool at the moment. Having an issues with the library dependencies, but once I try it out ill post my results. I looked through the firmware and the raster command (G07) are fully supported. Last I spoke to Tim Schmidt of LMN, the bug was found and fixed...I think it might have been pushed to the repo as well? Rastering is not working for me. The imagetogcode script puts out what looks like the right gcode, but when I run it the laser doesn't fire. And it won't fire again for cuts until I reboot. Also, note that the MSU generators gcode is not supported by LMN Marlin. Any luck getting rastering to work? I'd love to replace the electronics like you did but am hesitant to make the leap without that feature. If you are running through linuxcnc you may want to check out the setup that Area515 (my hackerspace) uses. We have full vector and raster control over our sharktooth laster. Probably would be easy to make work with your solution. Great job, Dan. You pretty much blasted past me on all these upgrades, thanks for documenting! The heat is just unbearable in my garage so I haven't been able to work much on the laser or CNC. Guess I can just follow your lead now :). Laser Marking Machine - The Future of Product Labels, Might be unbearable atmosphere for the product. Try to keep in cool and airy location. I actually have one of these as well, and the ramps. But I'm pretty sure I have a newer laser supply. Anyway I can't seem to get the plug in to work with the newest version of inkscape what version are you running? I'd love to get this thing up and running. I'm using Inkscape 0.48.5 r10040, with the github plugin - hasnt been updated for 11 months. Be sure to copy the files thlaser.py and thlaser.inx into your nkscape extensions folder. I posted the alternate Laser supply connections above, If you have one that's different then the 2 listed above I'd like to add it to the list so everyone can get their system converted. I just acquired one of these type of laser cutters. It has a CorelLASER board instead of Moshi .. still equally as craptactular :) Any updates on your project? How is the to-do list going? Any particular limitations of function? 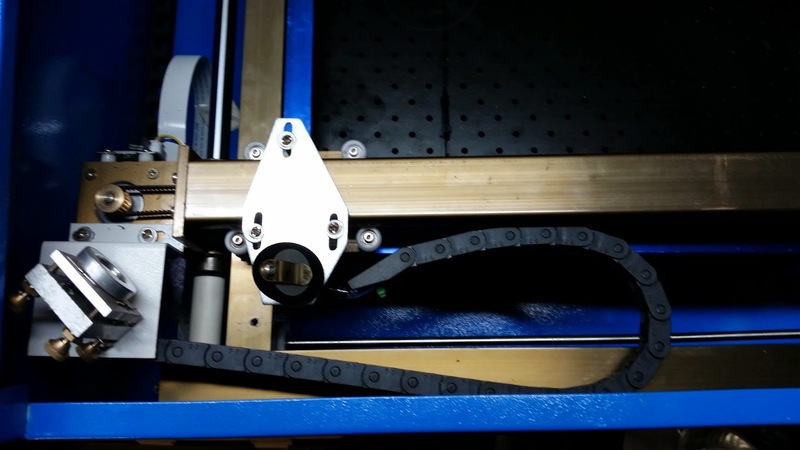 I am choosing to go for an adjustable laser lens instead of a variable height platform (www.hackahobby.com). Unfortunately time has been a problem lately. 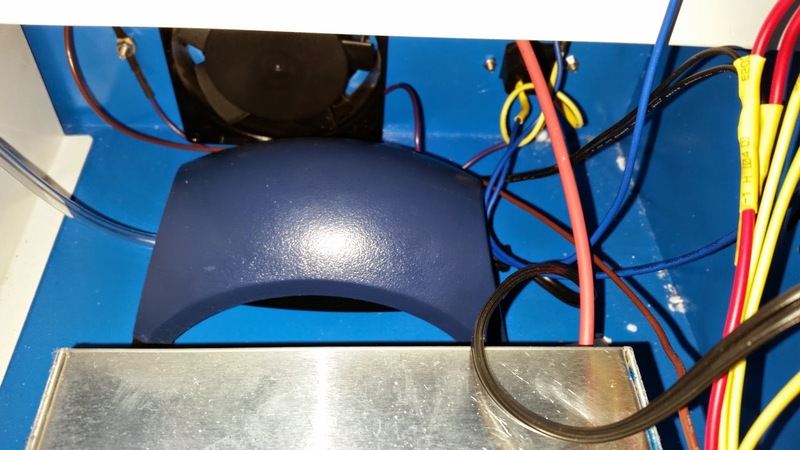 I did manage to get the Laser power supply fan installed, case switch, water flow switch, and a digital ammeter. 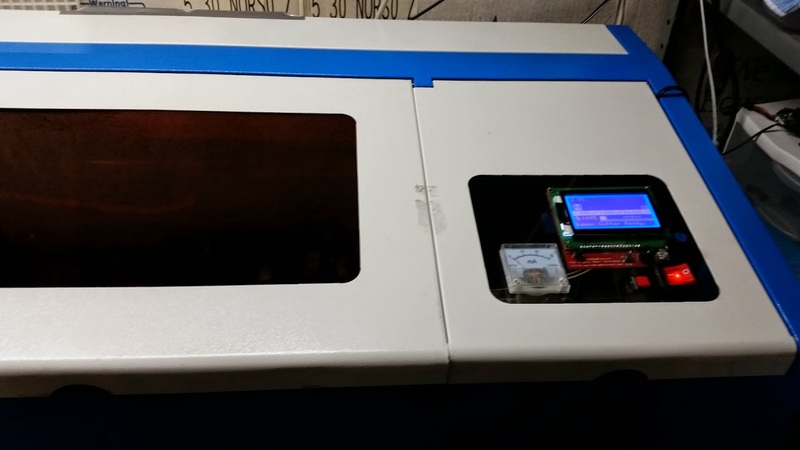 It works great on acrylic, I ended up printing another panel to accommodate the digital ammeter. It's totally usable, except the raster engraving needs some testing. I'm hoping this weekend I'll be able to take more pictures and post more updates. The variable laser lens focus looks like a good idea. I'll have to look into that. The only limitations of function so far seem to be the bed size... I'm debating building a T slot aluminum frame to mount the innards to, that will allow a 12" x 24" cut/engrave plane. I really need to do this, the laser has just been gathering dust laity as I have not had any time to mess with it. I really want to build a new structure for it as well but don't have the funds atm. Less I can find some super cheap t slot and I mean super cheap. Yep, final dove in and did it. Got both axis working as well as an induction sensor for the Y axis. I have the second power supply, but I have documented the build with lots of pictures so far so I will post it to my blog and give ya a link when I'm finished. What are your steppers set at 1/16th micro stepping? My Y axis sings alot and my x axis does at times as well. Looking forward to seeing your buildlog! I noticed that neither Dan's nor LMN's Marlin versions implement G96, so the laser intensity is always 100%. 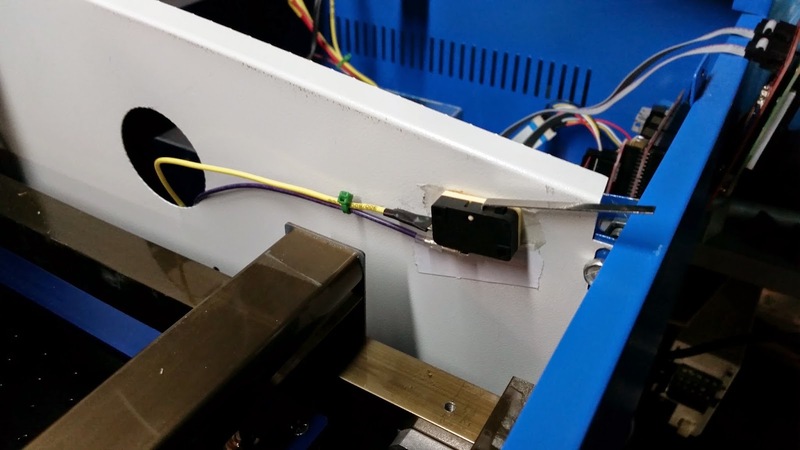 At first I thought I had wired up my laser PSU incorrectly, but after modifying my gcode to add intensity level to the M3 command and then looking at the Marlin code it seems that this is an omission. 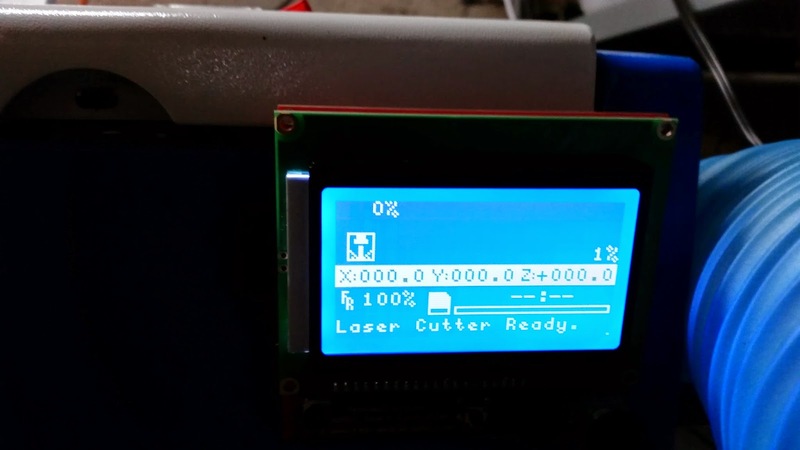 Also, if I stop the cutter from the LCD (SD>Stop print) and home all (G28) the laser fires up at the last intensity set during and after homing. That's great, I'm looking forward to the build link and pictures. I have the RAMPS set for 1/16 stepping; I had to tweak the current on the pololu drivers to minimize the singing, but there's almost always a little bit on my build. Works great though. AJF, that's not good with the laser activating after homing... I've done it with mine and havent observed this... I'll take a look through the code. The guys over at LMN are awesome, I bet they could implement G96 in no time. I'll give it a try (time permitting). Part 1 of my build log, figured you would like to see it. sent off for a "middle man" board i designed in eagle cad to make connecting the Ramps a little less Medusa like. Jeremy, do you mind if I link to your blog up top? You should submit it to Hackaday.com. I think alot of people would find it a good read. What makes you think your current one isn't PWM? The vast majority seem to be. I've modified THLaser a bit so the gcode is compatible with LMN Marlin. It also let's you set separate feedrates for cut/non-cut moves. Nice! Thanks AJF. The addition of the cut/non cut feedrates is huge. I was hand editing the gcode for these, gets annoying real quick. I'm hoping to have some time this weekend to debug the raster engraving. Thanks, Dan. Unfortunately, it's still not very good and I wouldn't recommend using it for any real gcode. LMN's web tool provides much better results. Hello and thank you for the build log! I have attempted to follow your lead and I have it all together and all I get is dancing servos. Anything I send just makes the servos dance back and forth about one mm. Any Ideas or advice for rectifying this would be much appreciated. I know the servos work as I ran it just before swapping out the brains, and I'm fairly certain I have the wiring correct and I have quadruple-checked the steppers with a ohm meter to find the correct pairs. Did you have to change anything in your settings to make them work? Disconnect the ribbon cable (to debug) and check that Y is working. Like Gabriel said, I'd check all of my grounds. Try one axis at a time. I didn't have to do anything special for the x,y,z axis in the modified firmware. Just the Laser activation pin. Maybe post a couple pics? I found it! The pins in the ribbon were not getting a solid connection. the center was bowed so the slot was a d shape. I heated it up and formed it back to the correct shape and now its up and running! May I suggest the following changes? - Add an extra g-code where you have tests scenarios. - Connect Ribbon 3 and 6 to Aux-2 instead of Aux-3 (aux-3 is used for the front panel). - I use DuPont Breadboard Jumper Wires for almost everything, and it's working perfectly! - XA- XA+ XB- XB+ just need to be reversed if the motor goes in the wrong direction, same with the Y axis. I need a longer connector between the screen and the Ramps... mine is a bit short. I have written on my power supply: "G P L G IN 5V"... is it equals to "P1 P2 LaserFire GND LaserPWM 5v"
Now I can call a layer in inkscape a number between 0 and 100 and that is the power setting for the laser in the gcode. The G96 instruction doesn't seem to do anything on my board, I have to set laser power with the M3 SXX instruction so that is what the line above does. Note: I have no idea how to python programme so if there is something wrong with that line please let me know. I just copied it from a few lines above and changed it. We are on the first steps of following this. Yet we noticed that our power supply is different from yours. The P+ and G are shorted. Does that mean its the same as P1 and P2 from your diagram? Also, can we say that the IN pin is the LASER_PWM and K+ is the LASER_FIRE? This is the same PSU as yours. Hi, unfortunately we don't have any smart reprap lcd. So we used a 16x2 hitachi. 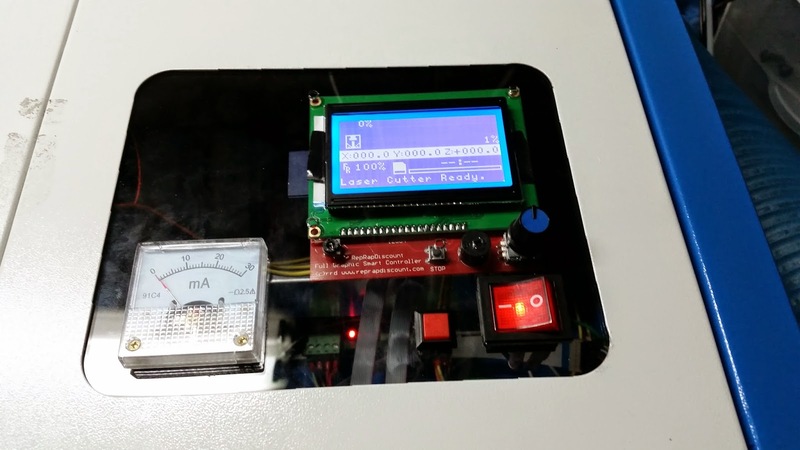 It displays "Laser Power: 100 X 0 Y 0 Z 000" now. The thing is how to control through the menu using push buttons? Please advise.. Thank you very much. Just one thing. You might want to reference THinkscape to the actual originator. I believe it came from our Hackerspace in Hamilton, Ontario. It was modified to its current form by Peter Rogers. Your credit us to what we'd call a secondary source. also I have it connected as advised above D6 to IN, D5 to L but now I have a problem of different sort, when i go for test fire on RAMPS it turns constant ON for laser also after firing test fire and than pulling D5 cable laser goes off so is it my bad wiring or is it an error in marlin where it does not turn laser off again? I have the same PSU as the last post anyone get this to work with marlin and ramps? 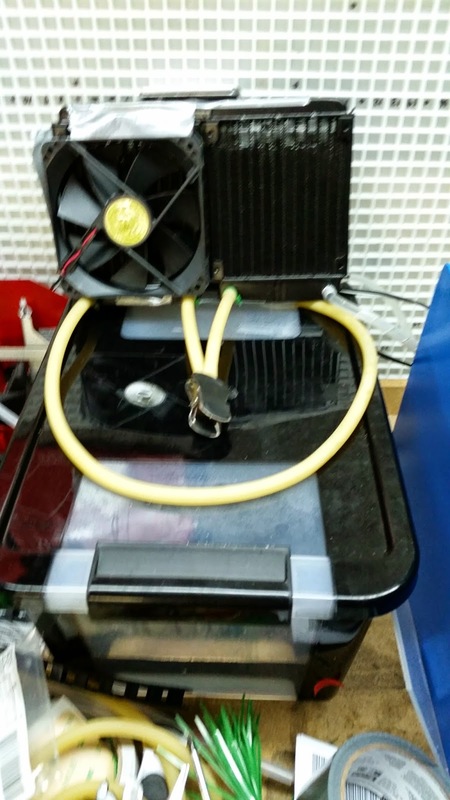 can you only use distilled water for the cooling, or can I use distilled water and antifreeze? 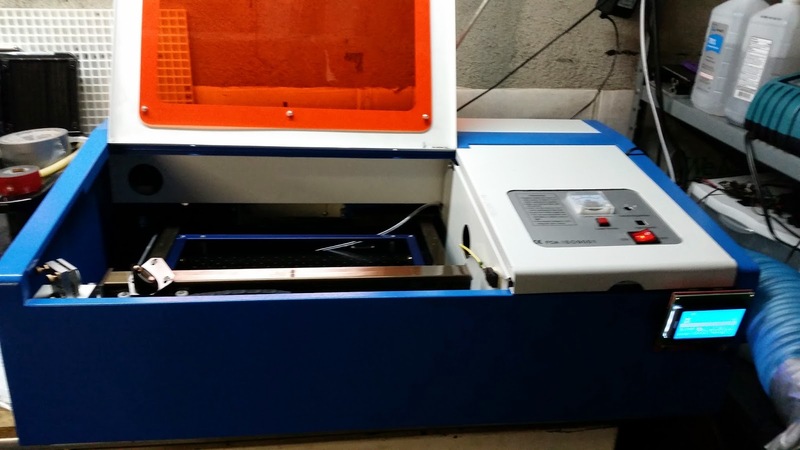 I am setting up a laser cutter like yours in my home shop. However, I have heaters out there but it is not heated all the time and I dont want to water to freeze and damage the laser. I bet you wouldn't have any problem with antifreeze. It shouldn't react with your pump or anything, and algae and whatnot would have a hard time growing in it. Got a Problem with the steppers as well... they move in the right direction, but only in one direction ("-"/negative values), in "+" direction, nothing happens, only a little bit of high pitch noise until I change direction again. tried to connect both endstops to gnd, no change... any ideas? mine did the same with my ramps conversion make sure that there is enough voltage to the motors from the drivers(on the ramps board). you can adjust them with a multi meter and small screwdriver. does anyone know what the max current of the usual 40w stepper motors is? so I think I got the drivers set up correctly, seems as the board/software registers some "hit" end stops at the extreme ends (non-zero-ends) of the platform. at least the motors act exaktly like when after they hit the zero-endstops - are there any pins meant for positive endstops that I can just put to gnd? just found the solution: I had to ground D2 and D15, as the software expects max endstops for x and y, which my machine does not have (maybe I should add them sometime...). I am stuck with what to do with all the files I have all the hardware I know how to program arduino's but unsure were to put all the files could somebody point me in the right direction please. I would like to know if anybody is supplying the arduino ready programmed for this project Please. Ill see if i can make a tutorial tonight for loading the arduino with the software. Nice Blog on laser machine, keep doing great work. Nice blog. Enjoyed alot to read it. I must say it is very good. Sorry if I missed it in all the comments but did you get the raster working, how it the resolution, the same? if you have engraving working how many mm/sec are you going? I would live to buy an arduino image off someone as I am challenged on the computer side. I am currently making a huge table cnc and decided to put my old laser k 40 on the other side of it. Thanks! I'd love to give it a try. Do you support G07 raster lines? BCL only does cutting and surface line burning at this time. There is a software section on that forum for BenCutLaser and there is a thread about downloading it. Email me with setup questions, etc. support_bencutlaser_us I look forward to working with you. Air Pump is very helpful for any fish tank setup. it is easily buy form amazon …..
For drawing i use sketchup. do you now a plugin or a good tip to lasercut scketchup drawings. 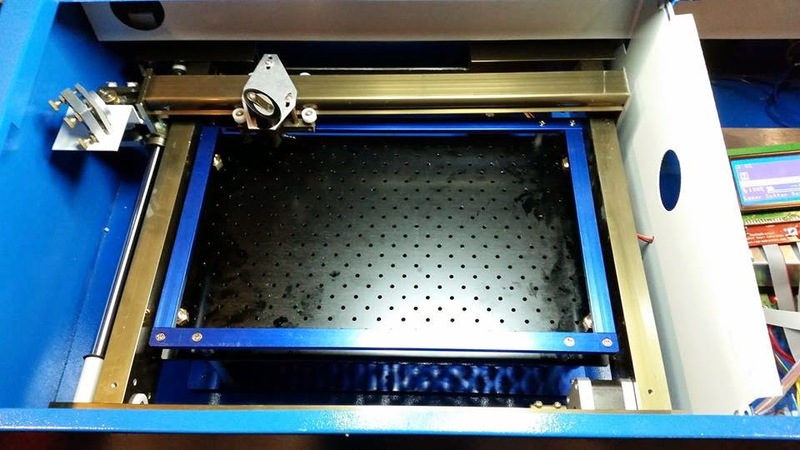 I'm 90% finished with modifying my BenCutLaser (BCL) CAM software to support the Smoothie controller board that one of my customers is installing into his 40 watt CO2 laser machine. 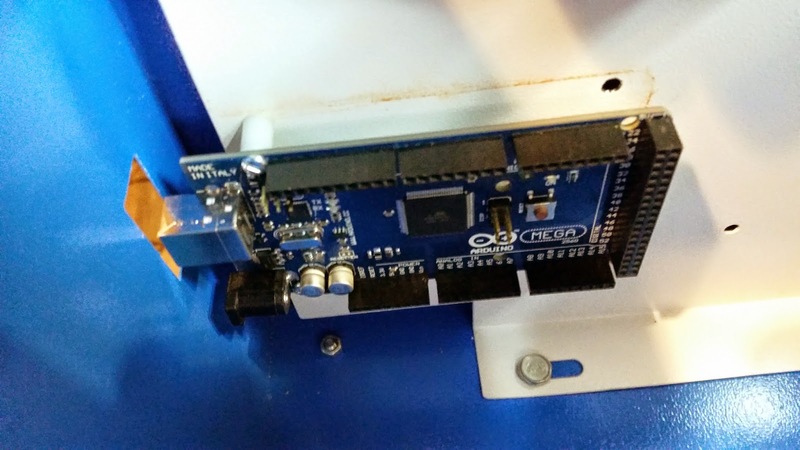 BCL already supports the RAMPS 1.4 board, so anyone using that board with their 40 watt CO2 laser can use BCL as their CAM software. I used to really like the RAMPS 1.4 board until I burned up two of them on my 3D Printer. Check your 12VDC input power lines often and make sure they are not melting! I've read that some people have this problem with their RAMPS 1.4 boards and some do not...so be careful and be aware. Well I tried to send a comment with some updates. I had to invert the ammeter and move the large circle closer to the screws for mine. I also had to change the geometry of the laser-enable button as mine wasn't square. Also printed a little button that sticks up for the stop switch. Also cut a few circles 6mm outside and 3mm inside circles to act as spacers for the screen. I used LaserDRW to actually cut as I haven't finished the conversion yet. Its file is included as well. Current limitations are the Raster lines. I believe the firmware still needs some more tweaks. I'd love to see some pictures of your mods and build when you get a chance. 1. Smoothie board. Comes with its own firmware. 2. Cohesion3D Mini board. Comes with its own firmware. 3. MegaPi board. Can flash Grbl 1.1e to it. 4. RAMPS 1.4 board. Can flash Grbl 1.1e to it. The Smoothie board is the most expensive, followed by the Cohesion3D Mini, but both boards have nice advantages and their quality is extremely high. The MegaPi would fall in the middle, cost wise. The cheapest board solution is the RAMPS 1.4. The shield is very inexpensive, under $10.00 USD. 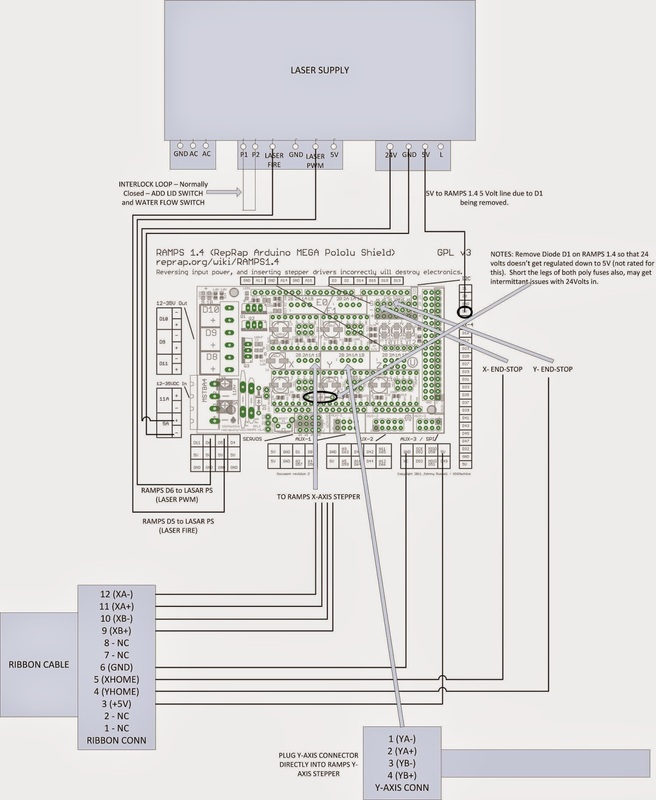 Then you'll need a Mega2560 CPU board, about $30.00 to $40.00 USD depending where you buy from. In addition to being able to use BCL software, you'll also be able to use T2Laser. In addition to those two, there are additional software solutions available, so you'll have a nice choice to chooses from, once you make your move to one of the above boards. Ralph, does the Grbl 1.1e variation support Raster lines? Hoping that I have time in the next couple weeks to try your BenCutLaser. Once I have a chance I'll post my findings on here, and put a link to your software up above. Yes, Grbl 1.1e supports raster for engraving images and photos. I'm in beta test now with BCL as I've just added Engraving support for images and photos. B&W and GS. hmmm i seem to get some errors when trying to compile the firmware.